The story of HMS Iron Duke became so embedded in our family history that there are reminders in many of our family photo albums of the other lives of the Duke. One was my grandfather’s love of sailing. Seen here in New Zealand when he was serving as Governor-General. The Admiral at sea with another Iron Duke. Only discovered this year in our attic, a more informal photo of the Admiral and the Iron Duke. An idea of the size of her guns can also be better illustrated by comparing the size of a London red double decker and her forward 13.5inch guns. Andrew Choong at the National Maritime Museum’s brass foundry holds all the ships’ plans and likes to use this illustration to get the point across to visitors. 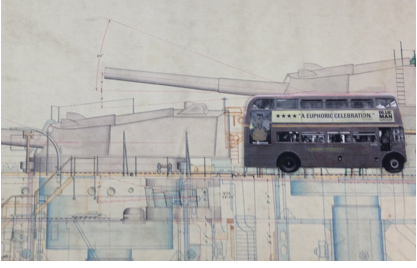 What a London double decker bus would have looked like if placed beside one of Iron Duke’s 13.5inch guns. The ties between the Iron Duke and the families continue today with regular visits to and correspondence with to-day’s Type 23. 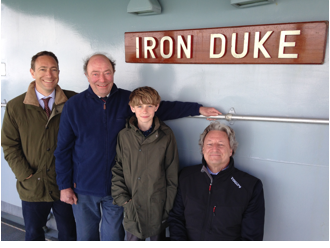 The Latham family visiting HMS Iron Duke on an Open Day in 2015. From Left to right: George Latham (Richard’s second son), Richard Latham (my cousin), Elliot Latham (George’s son) and myself. 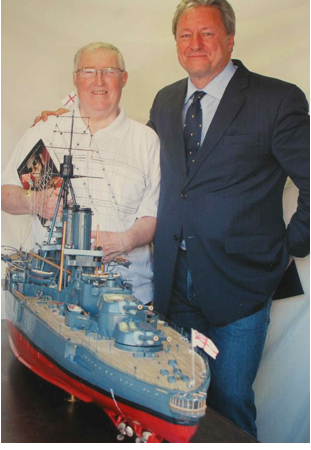 Still the fondest memory I have is of the day when Ron Horabin, an ex-brickie from Runcorn, Liverpool, astonished me with the generous gift of the scratch model of the Iron Duke to the Jellicoe family’s safekeeping and use during the Jutland Commemoration. He’d taken three years to build her. It was an extraordinarily powerful moment for me and I often thought of what Ron would have thought if he could have seen his model in Denmark and Germany’s best maritime museums. R.I.P Ron., thank you. A proud day for each of us. Ron Horbain and Nick Jellicoe. 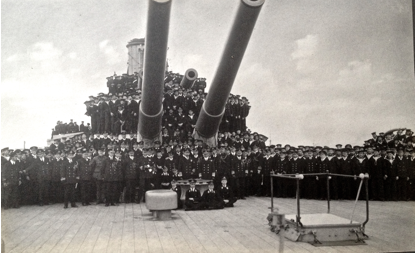 On May 31st, the Iron Duke was well remembered on the North Sea at Jutland. She accompanied HMS Duncan and the German frigate Brandenberg at the wreath laying. 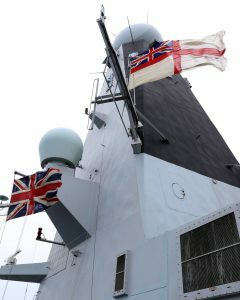 On HMS Duncan, Iron Duke‘s battle ensign and her Jack both flew for the first time in a hundred years. Both had been at Jutland. 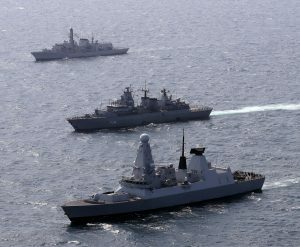 HMS Duncan joined FGS Brandenburg and HMS Iron Duke to commemorate 100 years since the battle of Jutland. I recently received an e-mail from someone whose grandfather was a young telegraphist serving in HMS Iron Duke. 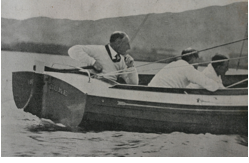 Shortly before battle was joined, Admiral Jellicoe asked him to make two mugs of chai and report back. “My Grandfather did so and offered the Admiral one mug before asking who the second was for. 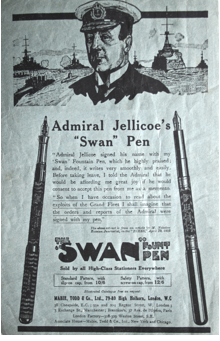 Jellicoe replied that the second mug was for him and as they drank their chai, took the time to talk to my Grandfather about what to expect during the battle, and to encourage and reassure him. I clearly remember my Grandfather telling me the story more than 60 years after the event and it obviously had an extremely positive impact on him – indeed he used it to illustrate how an officer should always find time to look after his subordinates”. I was very touched by his story.